After our exciting sunrise adventure at the North Rim (see previous post), we packed up camp and hit the road for Zion National Park. It was a fairly quick drive but by the time we got there (around noon), we had already been awake for 8 hours and the heat was unbearable as we started setting up the tent at South Campground. Miserable and pathetic, we were starting to realize any sort of hike to Angel’s Landing that day was not going to be very enjoyable. 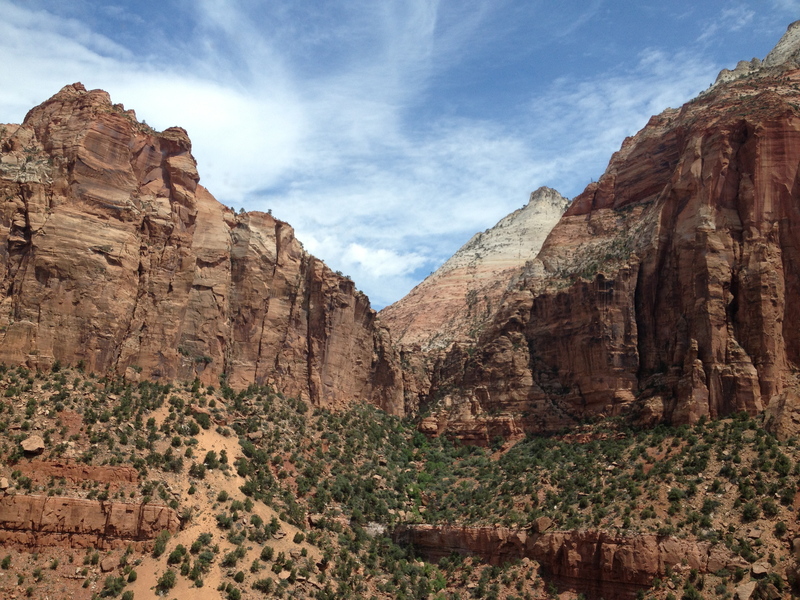 And considering we had just spent the last five days seeing so many breathtaking cliff and canyon views, we were worried any memories made at Zion would just sort of blend in with the rest of the Southwest. Maybe it would be best to save some sites for revisits in the future. So we are a little sorry to say we packed up the tent again, bought some & much needed ice cream in town, and set out on a 9 hour drive to LA. Below is a little snippet of what driving through Zion looks like (: Can’t wait to go back and tackle Angel’s Landing for real some time!